This coyote was in a desperate situation - caught in a barbed wire fence with no way of escaping - until this man comes to free him. The man persists in trying to get the coyote untangled, until he finally succeeds. When the wild animal runs off the man notes that although the wild animal got cut and scraped, when the coyote ran away it seemed fine. Coyotes are very resilient and adaptive to man's intrusion into what was once their environment. They have adapted so well that they now live in cities as well as the countryside throughout America. They are very elusive and nocturnal and many times people do not even know that they live among them. However adaptive they are sometimes they can find themselves in desperate situations where they are at the mercy of someone to help them. Such was the case recently where a coyote became entangled in a barb wire fence with no way of freeing itself. 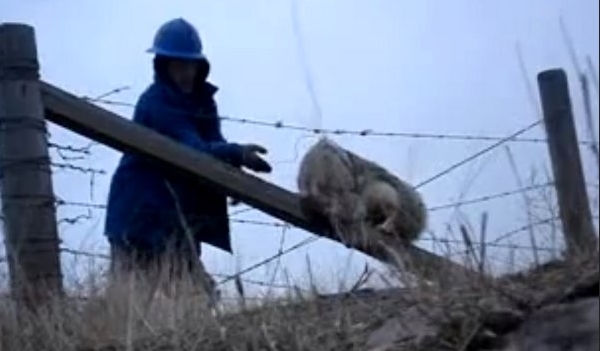 Luckily for the coyote, a man comes along and sees him stuck and bleeding in the fence. With a pair of wire cutters the man begins to cut each strand of wire until finally the coyote is free and runs off. Responses to "Brave Man Saves Coyote Caught In Barbed Wire Fence "
I wish there were many ,many more people that have a heart such as yours. Since animals can't talk I will for the coyote. Thank you for saving my life instead of leaving me there to die a slow and painful death. You are one of God's creatures also and a hero to me.